I've been setting myself some small goals in an attempt to motivate myself to do more. Recently I've found myself stuck in such a rut with both a lack of routine and a lack of motivation. I find I'm often aimlessly scrolling on my phone or staring at my laptop waiting for something fun to happen and I realised that actually, I need to make the fun happen (ok, fun probably isn't the best word to use in this case but bare with me...) After a busy weekend, I set myself some goals for the week ahead and surprisingly, actually tried to stick to them! So I thought I'd share what they were seeing as I often struggle to find motivation and setting myself these small goals helped. Having completed a year of blogging full time in September, I noticed how little I left the house on a weekly basis. Prior to taking the plunge and doing this full time, I was a full time university student so I had to spend time on campus for lectures and seminars, I went out with my housemates and would travel back home on weekends or have family and friends visit me at university - basically, I had plenty of reasons to be out and about. With blogging, this just isn't the case. Yes, I have events and meetings but I personally try to fit these in to a couple of days a week because so much needs to be done behind the scenes (from filming for YouTube and shooting new content to editing videos and photos, writing blog posts and responding to emails) I found that sometimes I would spend days at home without venturing outside and not even realising! It's so important to go outside and get some fresh air, most people do this on their daily commute to work or on their lunch break but I don't really have either of those when I work from home. Setting myself this small goal was the push I needed to get out more, even if it's just nipping to the post office. This is such a hard one because I spend so much time on my phone as part of my job. Whether it be taking new photos, editing photos, planning my feed, scheduling posts, writing captions - honestly, the list is endless! On top of that, I spend a huge amount of time scrolling through Instagram which I want to actively try and cut down. Since the latest iOS update, I've become much more aware of how long I spend on my phone and on which apps I spend the most of my time on. Instagram of course was top of the list with a daily average of 2h15m. It's definitely baby steps with this one but I thought I'd start by setting myself a daily limit (you can set this up on the Instagram app, you get a notification when you've spent x amount of time on the app), I decided to set my limit at 1h30m per day. Don't get me wrong, I failed every single day - on Thursday I spent a whopping 3hr21m on Instagram - but the intention is there. With that said, I've definitely noticed my notification popping up later and later each day which is a sign that I'm working towards that goal (if that makes sense). To add to the lightheartedness of this blog post, I'm trying to make an effort to experiment more with eyeshadow. I'm somewhat minimal with my makeup, mostly because I'm not that great at it, and one thing I've never got the hang of is creating eyeshadow looks - I don't have very big eyelids and just generally find it difficult to create eyeshadow looks, what more can I say. As with everything, I think practice helps so I'm going to continue to do my best to practice! I actually wore eyeshadow 6 out of 7 days last week which I'm really pleased about. I genuinely got more use out of my eyeshadow palettes this week than I have done over the past few months haha! I say this time and time again but I really want to get back on track with my blog. It's something I have struggled with for months but I really do want to get back into it. One thing I decided to do this week was to just write. If an idea springs to mind then I create a new blog post, even if it's just a title to come back to later or a few ideas I want to explore. This has really helped me to feel re-inspired! I have a few blog posts scheduled over the next couple of weeks including the first of my Christmas content which I'm SO excited about! The issue previously has been wanting and waiting to take pictures before planning a post. Ultimately, planning a blog post around images as opposed to around what I actually want to write about. I'm hoping that this switch will help me feel a bit more inspired in terms of the content I produce and what I want to write about. It also makes shoot days slightly easier because I can have a blog post title or idea in mind and then go from there! After toying with the idea of moving from Blogger to Wordpress, and deciding against it, I've felt like my blog is in need of an update. Ideally, I'd have a whole new design but there is nothing wrong with my design at the moment - I just sometimes feel like I'd like to hit refresh in the hope that it will make me feel newly inspired. In the meantime, I thought a few updates would help! So this wasn't planned, it sort of just happened. I decided to change up some tabs and categories - nothing major - but still, small changes that I'm quite pleased with and I hope you'll find useful too. First up, a new category. I decided to add a blogging category which you'll find under the categories tab. I've started to write a bit more about my experiences with blogging and Instagram which I'm really enjoying, I find it so insightful to look back on and I'm just enjoying putting together blog posts on the subject. A lot of people who read blogs are also bloggers themselves so I hope it's something that could be helpful. Christmas! With Christmas right around the corner, I have a lot of upcoming Christmas content to share with you and so I thought adding a brand new Christmas section would be the easiest way to keep everything in one place. Here you'll find everything from my festive blog posts to some gifting ideas for the season! It has its own pride of place sitting on my navigation bar (at the top of my blog) and you'll also find a new Christmas category under the categories tab. Finally, I've introduced an A-Z of brands / Brand Directory which you can find under the shop tab. Here you'll find a list of brands, links to shop (these are affiliate links - read my full disclaimer here) and every blog post that brand has been featured in on my blog. It's a nice way to be able to see brands I love featured on my blog whether you want to do some shopping or you're in need of some inspiration. Will you set yourself some small goals this week? Yes! Great post. I'm so guilty of making a hundred goals at once and expecting myself to achieve them all immediately. It's so much better to make small, achievable goals and then it's easier to stick to them and they become good habits. Win win! This week I'm determined to keep my Duolingo streak going, and I'm trying to do at least one thing on my enormous to do list every day. All five of your goals sound like they would make great New Years resolutions for a lot of people. Your eyeshadow goal sounds like fun (and great for blog updates with a beauty component). There is something about having routines that I find very comforting. 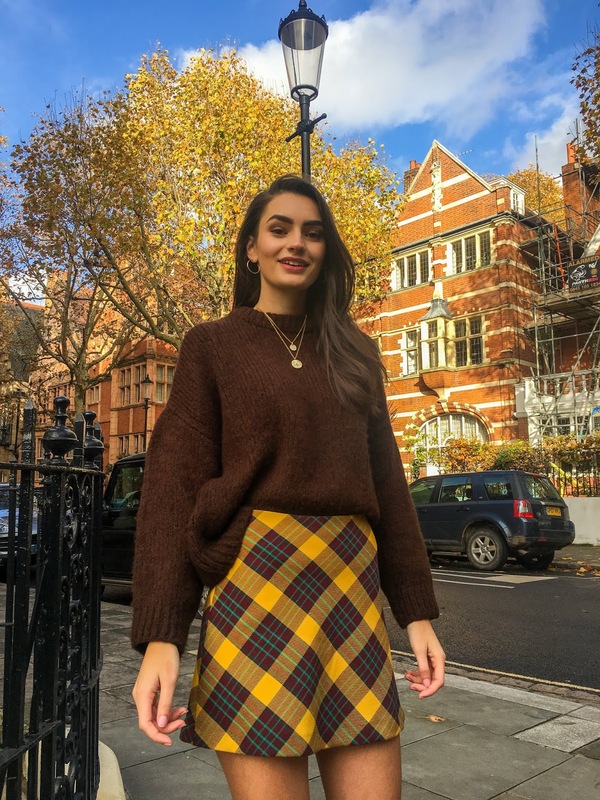 That yellow plaid miniskirt and brown jumper look fabulous styled together and being worn by you. You look very pretty.